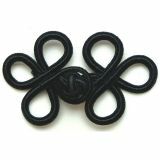 Rayon Braid Frog Closure - WRIGHTS-Rayon Braid Frog Closure. Frog closures offer unique, decorative closure solutions for clothing, handbags, and more. Easy-to-apply with a few anchor stitches by hand or machine. Closures are available in a variety of sizes, shapes, styles and colors: each sold separately. Imported.